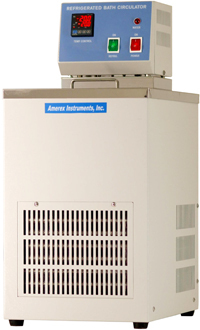 The CB-212 and CB-222 are closed-loop refrigerated circulating baths ideal for direct immersion of samples or for cooling in many laboratory equipment such as rotary evaporators, lasers and chromatography systems. The CB-212 is a compact 9-liter bench top unit while the CB-222 is a 19.5-liter unit mounted on casters that could be placed on a bench top or the floor. Each bath features a PID microprocessor temperature controller for precise and stable temperature. The working temperature range is from -25°C to 100°C. Other features include a low-liquid level shut-off, an easy-to-read bright LED digital display, a bath drain valve for easy cleaning and replacement of coolant, and easily removable front grille for periodic condenser cleaning.